These secrecy laws are questionably constitutional. In 2015, the ABA approved a resolution asking states that impose capital punishment to publicly disclose the protocols and suppliers used in lethal injections. The resolution noted several constitutional concerns with state secrecy laws. State secrecy laws may violate the Eighth Amendment by making it virtually impossible for prisoners to satisfy the burden of proving that a state’s lethal injection regime constitutes cruel and unusual punishment. State secrecy laws may also violate a public right of access to executions and execution protocols guaranteed by the First and Fourteenth Amendments. Prison inmates have had mixed success in challenging the constitutionality of the secrecy statutes. While inmates have won rulings at the district level, most state Supreme Courts have upheld these secrecy statutes, sometimes due to political pressure. For example, in 2014, the Oklahoma County District Court ruled that Oklahoma’s secrecy statute unconstitutionally violated prisoners’ rights of due process because it barred litigants from discovering the names of the drug suppliers in civil or criminal proceedings. The Oklahoma Supreme Court initially agreed with the district court, but eventually held that the state secrecy laws were constitutional after lawmakers threatened to impeach the judges. Recently, a Missouri Circuit judge ruled that Missouri must release the names of pharmacies that provided lethal injection drugs for executions. The Supreme Court has not ruled on the constitutionality of secrecy statutes. In 2014, an Arizona death row inmate appeared before the Ninth Circuit, asking the court to force the state to release the identify of the drug supplier that made his lethal injection drugs. The Ninth Circuit ruled for the inmate, finding that nondisclosure of the lethal injection drug supplier violated the inmate’s First Amendment’s right to information about the state’s manner of implementing the death penalty. However, three days later, the Supreme Court reversed the stay in a terse order, finding that “the district judge did not abuse his discretion in denying Wood’s motion for a preliminary injunction” but did not elaborate on Wood’s constitutional claims. Virginia’s state secrecy amendment, if it goes through, seems less restrictive than other state secrecy laws. While the state has no obligation to make the identity of the drug supplier publicly available, the amendment does not bar litigants from discovering the names of the suppliers in criminal proceedings. Because many challenges to lethal injection statutes occur through criminal proceedings, the proposed amendment may be an empty gesture that would provide little protection for pharmacies willing to contract with the state to supply lethal injection drugs. 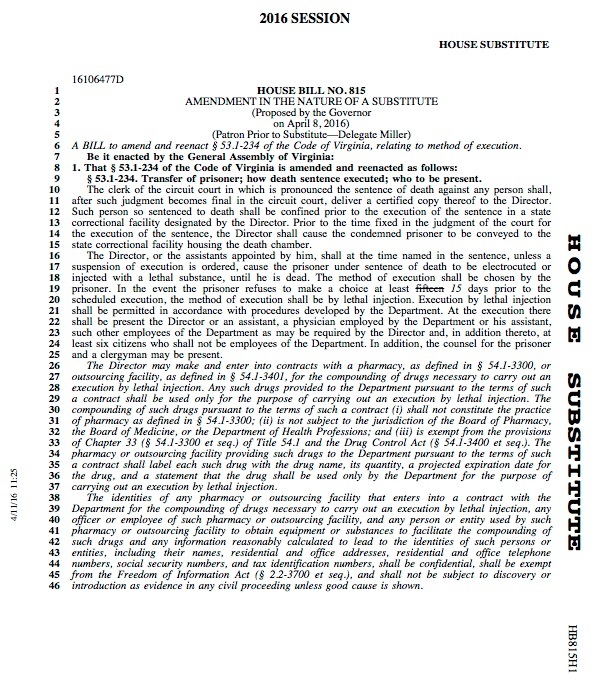 If the amendment becomes law, it remains to be seen whether Virginia’s new lethal injection policy would promote or effectively end capital punishment in the state.